Litespeed Titanium of Chattanooga, Tennessee has been making Titanium bicycle goods for years and is among the three most recognized Titanium makers in the US. Their mountain bike stem is made of Ti-3Al-2.5V Titanium tubing. The quill is made of tubing with a 1.4mm wall thickness. The 1" quill tube is carefully turned on a lathe to reducing the outer dimension, from 25.4mm to 25.1mm, beginning just below where the extension joins the quill, to make sure the quill fits perfectly into the steerer tube. The Titanium extension is ovalized, providing long joining surfaces. The extension is miter cut for the quill tube making a longer more stable, weld joint. The binder tube is made of 1.48mm wall thickness tubing. The binder tube and quill have holes drilled that face into the extension tube to reduce heat build-up and relieve stress during welding, and reduce over-all weight. The binder fitting is machined from Titanium rod, that's turned on a lathe to give a half-round shape in the middle, then bored to recess the bolt head and tapped at one end for the binder bolt to anchor in. The binder fitting is welded vertically to the front of the binder tube, and then the front of the stem is cut through to create the binder cinch system. All of the welds on the stem, are done with delicacy, making an even bead with no flash. In the top of the quill, is a machined aluminum cap piece, that has been turned on a lathe to shape, then drilled to seat and recess the head of the stem expander bolt. The expander bolt, made of Titanium, is 135mm long, with a 8mm by 1.25mm thread pitch. The expander bolt has a 6mm hex head fitting and weighs 31 grams. While many of the stem wedges we've seen are, frankly, bought from a Taiwan factory that makes good cast/extruded aluminum wedges, the Litespeed wedge is genuinely machined from solid aluminum rod, one at a time. The piece is turned on a lathe to give it the precise diameter needed and cut the wedge to length. It's drilled from the top, tapped for the expander bolt, then diagonally crosscut. The wedge is a work of art in itself. The binder bolt is machined of Ti, has a 5mm allen head, with 6mm by 1mm thread pitch, and is 20mm long weighing 3.5 grams. Brake cable routing for cantilever brakes is performed through the use of a cable hanger, (Ritchey, Dia Compe, Syncros available separately in the Brake section). The Litespeed mountain stem, has a 25.4mm inner diameter binder tube to fit all standard ATB bars without shim or a 22.2 handlebar with shim. The stem is made in a 1" or 1 1/8" diameter. The mountain stem is available in a 5 degree rise in 120mm, 130mm, 140mm, or 150mm lengths. A Litespeed Mountain stem in a 1 1/8" diameter in a 140mm length weighs 219.5 grams. A 1" diameter, in a 130mm length weighs 211.5 grams. Litespeed also makes a Road bike version of their Titanium Mountain stem. It's made using the same materials and techniques as the Mountain stem. The machining, welds, binder fittings and all bolts are the same. The binder bolt assembly is welded to the bottom of the binder tube instead of the front, as the Mountain is. It comes only in the 1" diameter, and has a 26.0mm inner binder tube diameter which fits all standard road handlebars. It is made only in a -14 degree rise, in 90mm, 100mm, 110mm, 120mm, 130mm, or 140mm lengths. The weight of the 140mm Litespeed Road stem is 192.5 grams. The Ahead version of the Muntain stem uses the same binder fitting, binder tube and extension found on the quill Mountain version. The Ahead version has a vertical tube welded in place of the quill tube. The vertical tube has a 1.48mm wall thickness and is 1 3/4" long. 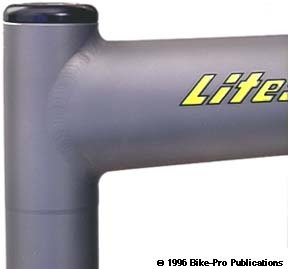 The Litespeed stem, (like Ringl, and Syncros) uses an internal clamping bolt, which Litespeed calls an "internal binder bolt". A 3/4" hole is drilled horizontally through the extension, near the vertical tube so that it intersects the welded joint of both pieces. Into this a 1.35" long Titanium tube that has a 3/4" outer diameter is welded. This tube sticks out, just slightly on each side to give a place for the welde bead to join the surfaces. Inside of the tube is the binder. It's machined from aluminum rod to a 17mm diameter outer diameter. A hole is drilled through the piece that permits a bolt head to be recessed, and have a narrower portion of the hole tapped for bolt threads. The center of the pice has a curve cut away from the middle, and the piece is sawn through leaving two halves with a quarter round radius at the inner ends. The binding bolt passes through the left side anchoring into the threaded half. Tightening the bolt constricts the quarter round aluminum ends around the stem quill. The inner binder bolt is made of stainless steel with 6mm x 1mm threads, is 25mm long, has a 5mm hex fitting, and weighs 7 grams. Like the Mountain stem, the Ahead version is available in a 5 degree rise in 120mm, 130mm, 140mm, or 150mm lengths, in either a 1" or 1 1/8" diameter. A Litespeed Mountain Ahead stem in a 1 1/8" diameter in a 130mm length weighs just 143.5 grams. Litespeed also makes a Road version of their Ahead stem, but only to fit 1" fork steerers . 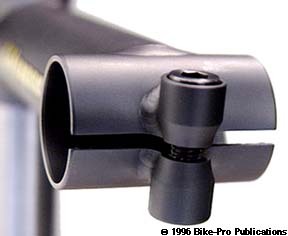 Like the Litespeed road stem the binder fitting is welded to the bottom of the binder tube, rather than the front. The Road Ahead stem can of course be used on a mountain bike. It is made only with a 0 degree rise in 90mm, 100mm, 110mm, 120mm, 130mm, or 140mm lengths.